Living Trusts in Cincinnati: Why Do I Need a Pour-Over Will If I Have a Revocable Living Trust? The Last Will is the most commonly used estate planning tool. You can express your final wishes regarding the distribution of your assets in a Last Will if this is your choice. However, you may want to consider the creation of a Revocable Living Trust as an alternative. When you use a Last Will to facilitate the transfer of your monetary resources after your death, the Will must be admitted to probate. The heirs to the estate are not going to receive their inheritances until the estate has been probated and closed. This process can be time-consuming. There are also considerable costs that can accumulate during probate. However, there are ways to arrange for the transfer of assets outside of the process of probate. Revocable Living Trusts are often used by those who would like to avoid probate. With this type of Trust, you do not surrender control of the assets while you are living. You may act as both the trustee and the beneficiary. You name successors to assume these roles after your death. The trustee that you choose will distribute monetary resources to the beneficiary or beneficiaries according to your wishes as stated in the trust agreement. These distributions will not be subject to the probate process. 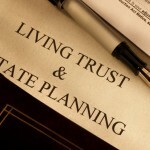 You may not place everything that you own into your Revocable Living Trust. You could do this intentionally with certain property, or you may simply never get around to funding newly acquired property into the trust. You can account for this by executing a Pour-Over Will. With this type of Will you state that any property that may remain in your personal possession at the time of your death should be funded into the Revocable Living Trust. This has been a brief look at Living Trusts and Pour-Over Wills. If you would like to learn about Living Trusts in greater detail, download our free report on the subject. To access the report, click the following link and follow the simple instructions: Living Trusts: Calculating the Benefits. You will naturally have a lot of questions when you are arranging for the transfer of everything that you have been able to accumulate to those that you love the most. We provide a lot of good information here on our website, but there is no substitute for a face-to-face consultation with a licensed estate planning attorney. Our firm provides consultations to people here in the greater Cincinnati area. If you would like to schedule an appointment, take a moment to contact us through this website or give us a call at (513) 721-1513.